With all due respect to Sir William, I have to say that he got this one wrong. 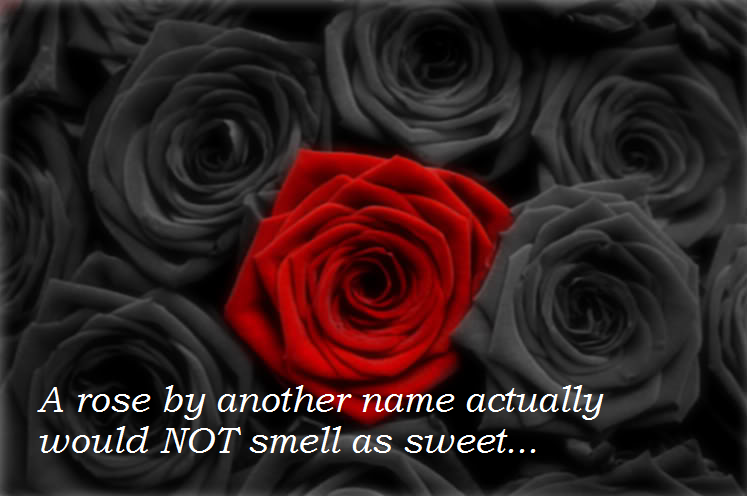 Sure… technically a rose gives the same olfactory experience no matter what it is called. There obviously is nothing about changing the name of an object that also physically alters that object. That being said, a change in name does alter a person’s expectation and thus affects how that person experiences the object. For example, I enjoy drinking Sprite and like everything about the carbonation and the sweet citrus flavor. However, I once picked up a glass of clear liquid that I thought was “water” and then took a drink to find Sprite instead. I nearly choked- and was surprised and negatively impacted by an experience that didn’t match my expectation. It was the same Sprite that I have always enjoyed and that would show no difference in a technical analysis or a blind taste test… but it was different to me because it fit into a different context in my mind. I heard an example several years ago that has stuck with me and that really illustrates this point. A research team placed a consumer study on chocolate pudding and gave three different pudding protptypes to three distinct groups of people to assess which was the most “chocolatey”. One group received a pudding sample that was light, almost tan brown in color, the next group a sample that was a medium, typical brown, and the final group a pudding that had a dark, rich brown color. The study showed that the ratings of the flavor of the pudding correlated directly with the color of the pudding- the darker the color, the more “chocolatey” the pudding. As you may have guessed, each pudding actually had the exact same flavor and differed only in color. All differences were driven 100% by the color and the perception that these colors represented. The truly amazing part of the study? Not only were all of the puddings the same flavor… the flavor was actually “vanilla”! Not a single panelist noticed that the pudding was not even chocolate at all. It looked like chocolate and was named chocolate, so the panelists “tasted” chocolate. I love this story as it very clearly illustrates that design elements that we sometimes take for granted because they aren’t driving “real” performance can actually have a dramatic impact on a person’s perception of performance. Perception truly is reality and it is imperative that we consider this in designing our products, services, and experiences. 1) Insted of merely delivering “performance”, deliver “A Performance”! As I have said before, I am a big science fiction fan and I grew up at a time when Star Wars became my favorite movie series (the original not the new ones!). When you think about what made Star Wars successful, what comes to mind? The epic struggle of good vs. evil. The flawed characters who transformed into heroes. The amazing space battles, new worlds, and special effects. All of these of course were the heart of what made Star Wars great. But now imagine Star Wars without the epic John Williams soundtrack. The music is such a critical part in driving the experience of Star Wars- from the fanfare at the beginning, to the thematic music that moved the stories and characters along, to the very last celebratory notes to close the trilogy. While the soundtrack is not technically a part of the story itself, it is critical to the overall experience and the movies would have had an entirely different impact without it. To me, the holistic design elements that we drive into our innovations are analogous to the soundtrack to a movie. An iPhone camera would work the same if it didn’t make the camera “click”, but that click makes it feel more like a real camera. Dandruff shampoos don’t need to “tingle” on your scalp, but that is a powerful signal that the product is working. As we design our innovations, it is more than just driving a functional benefit… it is about composing a holistic experience. 2) Focus on the whole “journey”, not just the destination. A lot of products that we use and make are designed to deliver some sort of end benefit. We want clothes that are clean, cars that take us from point A to point B, and food that quenches our appetite. However, our enjoyment of the end benefit is almost always more driven by the experience in using the product than on the end benefit itself. You can get clean teeth without a minty flavor, but it is less refreshing. A Harley doesn’t need to have that distinctive engine roar, but it makes the whole ride more enjoyable. An example- When instant cake mixes were first designed, the design team found a way to make an instant cake mix in which you could “just add water” and bake it… and the resuls showed that the cake tasted at least as good as cakes made from scratch. The team gave the mixes to a bunch of moms, and asked them to try the product and to evaluate it. Consistently, the moms rejected the product. Baffled, the researchers asked “why?” Was it the taste of the product? Were the directions too confusing? No- the moms felt like it no longer felt like baking and that they didn’t feel the enjoyment of delighting their families. What was missing? The moms thought that they should at least need to crack some eggs and add them to the mix. This one simple step, while technically unnecessary and actually adding time and complexity, added to the experience of baking and became a critical design element. What are the “cracked eggs” in our product experience that may not seem important on the surface, but ultimately are critical to the overall experience? 3) Make design a part of the process from the start and not just at the end. There often is a temptation in doing product design to get the “real”, “functional” performance elements done first and then to add the “fluffy”, “experiential” design elements in later. Essentially, first make it “work” and then make it look “pretty” at the end. This is a huge missed opportunity, and innovation is must better served if design elements and design minds are enrolled from the start. Even in projects that are on the very front end of innovation where it is tempting to lock ourselves in the lab and to focus on the technical detail, we can benefit from having design involved from the onset. Often we can design performance benefits that are noticeable in lab testing or among the team, but can be missed by our consumers. While our projects may be our top focus for 40 hours / week, for our consumers they are just one of hundreds of experiences that they have on a given day. Design can help direct consumers to our new benefits through intentionally integrating signals and cues that emphasize performance. What should “clean” smell like? What should “fast” sound like? What does “healthy” taste like? If it looks like a duck, walks like a duck, and quacks like a duck… perception truly is reality and we should put as much energy into designing in the signals and cues of performance as we do to the technical nitty-gritty of performance from the onset of our programs. If you go home on Valentine’s Day and tell your significant other that you brought her a dozen “skunks” or you give her a bouquet of black roses, she will not enjoy the aromatic benefits of the roses you bought. In designing our products, services, and experiences, EVERYTHING matters and we should focus on each element of the entire journey. Make your product epic, and compose a symphony of impactful and memorable delight. All- I wanted to take a moment and thank all of you who have been following this blog via email and through the various sites in which I am posting. You may have noticed that I renamed the site “innovation on purpose”… It seemed like a more fitting title after a month of figuring out what would my focus would be. When I started this last month, I had no idea what to expect, and it has been truly humbling and exciting to interact with so many of you from every continent around the globe (except Antarctica… maybe I should write about exploration and igloos!). I’ve appreciated all the feedback and conversation and would love to hear any additional thoughts, ideas, or questions that you have. Thanks again for joining me on this ride- I look forward to continuing the journey! Previous How does LUCK play into successful INNOVATION? Next Are we first drawing up the “BLUEPRINTS” before “ARCHITECTING” our Innovations?